Just released today, First Playback and Music Notation Tool Designed Specifically for use with IK Multimedia’s Miroslav Philharmonik. 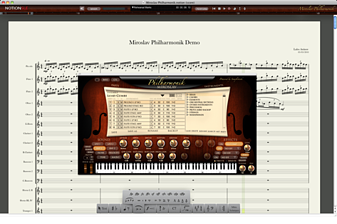 IK Multimedia and NOTION Music have created NOTION SLE for Miroslav Philharmonik™, a special version of the award-winning NOTION3 scoring software that is customized for use with the award-winning Miroslav Philharmonik orchestral library by IK Multimedia. NOTION SLE for Miroslav Philharmonik features instrumentation and articulation presets that automatically handle all articulation changes in the background, allowing for very realistic playback directly out of the score. Songwriters and composers no longer need to spend hours programming presets, templates and articulation changes — they can now simply focus on creating compositions. As you write and articulate your score, NOTION SLE will follow your instructions and automatically change to the appropriate Miroslav Philharmonik articulation patch during playback to accurately and realistically perform your score. Additionally, you can take full advantage of NOTION’s live performance features and conduct the full orchestra with an unmatched level of control.